When you're sitting with Antony in his workshop, the conversation often turns to education. Despite - or perhaps because - his father's financial difficulties forced him out of school at the age of thirteen, Antony places a serious value on education. Whether it's the practical welding training he undertook several years ago, the business training he now receives via his local Trust Group, or the schooling of his three children, it's clear that Anthony sees education as closely linked to personal and financial fulfillment. After he had left school, Antony worked a number of short-term jobs to raise the fees to pay for a short course in the basics of welding and metal work. This training turned out to be a good investment. In the area of Kiambu County where Anthony grew up, new buildings were springing up every day, and his welding business quickly found its first customers. For two years Antony spent most of his days shaping metal into doors, gates, and window frames in an open field. Despite the demand for his expertise, limited resources meant that Antony struggled to get his business to gain momentum. By this time, Antony had a wife and three children. Providing his children with a quality education was a priority, but because Antony's wife Lucy was unable to find work most months his single income stream was entirely used up with three sets of school fees and household necessities. In 2012, Antony was invited by a long-term customer and friend to become the 64th member of his local Five Talents Trust Group. For the first 6 months, Antony would regularly deposit small amounts that ranged from Ksh 300 to Ksh 2,000 ($3 - $20). During this time, Antony's Group received basic financial training and began to learn the basics of good business. After six months of demonstrating his commitment to the group and the business training, Anthony's peers choose to offer him a loan of $190 from the pooled savings. During the months it took to repay the first two loans (the second of which was for about $600), Anthony continued to benefit from the business and financial literacy training. Over time, the fruits of his work ethic were beginning to pay off. The combination of his growing capital and sharp business sense lead him to rent a large workshop on a busy street. With the remaining balance of the second loan, Antony was able to help his wife, Lucy, start a small grocery business. When members of the Five Talents UK team visited Antony's Trust Group in November 2015, he was servicing his 3rd loan of Ksh 120,000. Depending on the rate of work, Antony's company Rafiki Metal Works was turning an average profit of Ksh 1,000 ($10) per day. His growing customer base has meant that Antony has hired two of his neighbours to keep up. And that's not all! Lucy's grocery business has also flourished. Hearing Anthony speak about his plans leave the listener with little doubt as to his future successes: "I would like to expand my business by having another branch in a different location where I could reach more clients. The welding business has a ready market in developing areas like Murera Sisal and it is a potential place to work from. I also would like to increase my sources of income. I would like to build some rental houses that would give me a monthly income." For the moment, he is focused on paying his children's school fees, but having seen the combined benefits of the welding course and the business training provided by the Trust Group, Antony says that when he feels his business and family are financially secure, he will pursue a more advanced business management course. Learn more about Five Talents programs in Kenya and help more families like Antony's today. Reporting from Five Talents UK with Adam Dickens Photography. This photo, taken by Adam Dickens for Five Talents, features the dress-making shop of Beatrice in the village of Kibugu, Kenya. Beatrice once made ladies' garments on a sewing machine at her home. But after joining a Five Talents savings and loan group, she set her sights on expanding her business. Today, she has her own shop, a second sewing machine, and an employee. 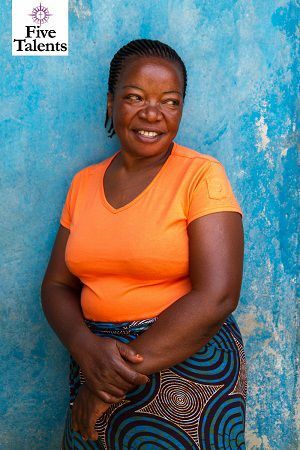 In the coming weeks, Beatrice hopes to invest in an embroidery machine with the help of a $160 loan.